Mustache You a Question. . . Yes, we must ask you a question and we're pretty sure it's a good one. Do all the wise men of history sport luxurious beards? We're pretty sure the majority of them do. We don't know why. Maybe when you use your brain over time you make your facial hairs grow faster. Or perhaps they simply were to busy writing down groundbreaking equations and starring at the stars to stop and shave. Either way, we think there's something to this theory. The anecdotal evidence is obvious and far from limited to the three wise men. Leonardo Devinci, Galileo, and Darwin all had lush facial hair. Even Einstein had a healthy stash. So, if your child wants to join the ranks of wise men, you know what they will need. While your parents might have sworn that you could grow a beard by eating the crusts of your bread, there's an easier way! This beard is instant! It stands out in a steely gray that wraps around your child's lower face with an elastic band. The mustache simply sticks to your wise kid's upper lip making talking and sipping refreshments easier than a one-piece facial set. While this particular beard has been designed for a specific wise man costume, presumably for a nativity play of some sort, the opportunities for this stunning gray set are endless. Halloween will be unforgettable when your child shows up as Father Time. 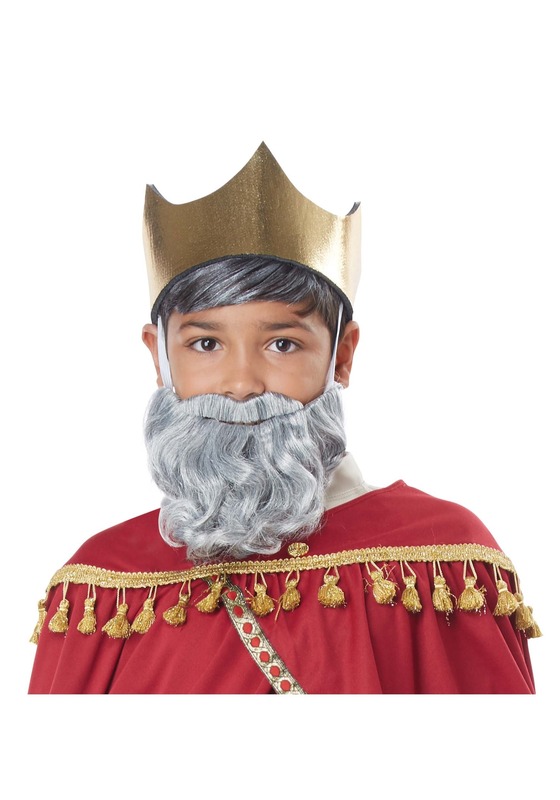 Your child will gain confidence playing Backgammon with grandpa if he's got a full beard (that's scientifically proven) and let's not forget about our bearded Wiseman theory. When homework is more difficult for one reason or another, fetch your child's beard and see if those math problems get solved a bit easier. You never know, if your kiddo wears this set long enough, you might have a student of philosophy on your hands!